Since the early 1970’s microcomputers (as they were called at the time) have been a huge part of the development of scientific instrumentation. As computer control of instrumentation became more prevalent, there was a need to also interface the detectors of instruments to the computer so that data (analog or digital) could be captured as it was generated, rather than output it on oscilloscope screens or chart recorders (see https://en.wikipedia.org/wiki/Chart_recorder). In the early years of the digital capture of spectral data the main limitation was storage capacity. As a result there was a practical limit on the time resolution (points per minute) and signal resolution (how many bits an analog signal was digitized as – see https://en.wikipedia.org/wiki/Analog-to-digital_converter). It wasn’t until the early 1980’s and the advent of the 5 1/4“ floppy disk which initially stored an amazing ~100 kB (0.1 MB) of data, that scientists were easily able to collect and save digital spectra. Today, instruments generate a vast amount of data and file sizes can be up to several GB each for certain techniques (e.g. GC-MS). This module describes some of the common file formats for spectral data, websites where you can obtain reliable spectral data, and software for viewing/simulating spectra. As there are many instrument vendors, there are many different file formats for spectral data. This approach was supported vendors who developed the instruments and software to operate them; thus, in order to go back and view spectra you need to use their proprietary software – which of course gets updated on a regular basis and generates revenue. However, the majority of software does have an export format for the data (and maybe some of the spectral metadata) that can be directly imported into Excel or other applications because this has been a need for users for many years. This is typically as Tab-Delimited Text (.txt file) or Comma Separate Variable (.csv file) files. Over time many scientists have lamented (even complained) that it would be much better if all of the data collected on instruments were stored in a common format that would make it easy to view and share data. While .txt and .csv files can be used for both activities, there has always been a need for a file format that supports both the spectral data and the associated metadata that describes the instrument type and settings, samples, analyte(s) and any other contextual information that gives the data value. Historically, this has been achieved using the following specifications (what are listed below are major specifications with formal standards – there are others that are less formally defined). This is for mass spectrometry and chromatography data and is described by the ASTM Standards E1947 – Mass Spectrometry (http://www.astm.org/Standards/E1947.htm) and E1947 – Chromatography (http://www.astm.org/Standards/E1948.htm). ANDI uses the Network Common Data Form (NetCDF) self describing data format that is generically defined to store array-oriented scientific data (http://www.unidata.ucar.edu/software/netcdf/). For UV/Visible Spectrophotometry, Infrared, Mass Spectrometry, Nuclear Magnetic Resonance, and Electron Spin Resonance data. JCAMP-DX is currently administered by the International Union of Pure and Applied Chemistry (IUPAC) at http://www.jcamp-dx.org, although the format has not been actively updated in almost 10 years. Although JCAMP-DX has not formally been standardized, it is currently the de facto standard for sharing spectral data and all the major databases store their data in the format. JCAMP-DX is a file specification consisting of a number of LABELLED-DATA-RECORDs or LDRs. 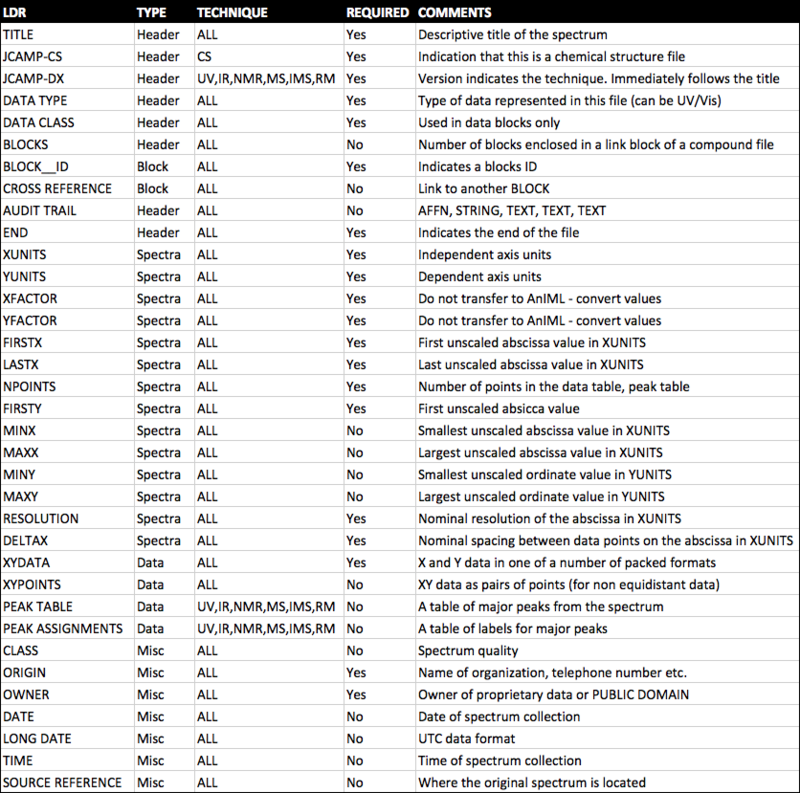 These are defined to allow reporting of spectral metadata and raw/processed instrument data. The table below outlines some of the main LDRs in JCAMP-DX. An example JCAMP-DX file is shown below. Note the LDRs for XFACTOR and YFACTOR. Although in the above example these LDRs are both 1 (because the raw data is already integers), these factors are commonly used to represent numeric values with a large number of decimal places as integers so that only one or two numbers (the factors) have to be stored as decimal values. This means that storage of rounded numbers is minimized and any error incurred because of rounding is applied evenly to all the data points. An example of data in this format is below. The data in a JCAMP-DX file can be all be compressed using a number of different human readable compression formats. This capability was added in order that spectral files were not to large for the storage media available (see above). There are four formats for compression, called ASCII Squeezed Difference Format (ASDF) outlined in one of the original articles on the JCAMP-DX format (http://old.iupac.org/jcamp/protocols/dxir01.pdf). These are listed below and use the letters as pseudo-digits. Note: The above characters replace the leading digit, sign, and preceding space for SQZ, DIF, and DUP forms. The remaining digits of a multi-digit number are standard ASCII. As can be seen, the best compression is obtained by using the DIFDUP format which results in a 22/7 or 3.14x compression of the data. However, this is not always the amount of compression that will get because it depends on how variable the data points are in the file and it is important to choose the right format to get the best compression. In addition to these existing formats there are a couple of newer formats that will eventually replace the JCAMP-DX specification. For all spectral data. AnIML is an eXtensible Markup Language (XML) format for storing instrument data and metadata under development since 2004 (http://animl.sourceforge.net). The specification is being coordinated under the American Standards and Testing of Materials (ASTM) E13.15 committee on analytical data. For all analytical data. The Allotrope Foundation was formed in 2012 from seven (now twelve) pharma companies around the notion of changing instrument data standards so that they were uniform across all instrument vendors. Three years later, Allotrope has just made available the first version of the Allotrope Document Format (ADF) that is based on the HD5 format for managing and storing data (https://www.hdfgroup.org/HDF5/). The ADF format stores data and metadata from the entire laboratory process (not just the instrument data) and is arrange in layers for metadata (using controlled vocabularies and ontologies), data, and linked files. The specification is so new that it has not yet been released to the community, but should be out by the end of the year. See http://www.allotrope.org. 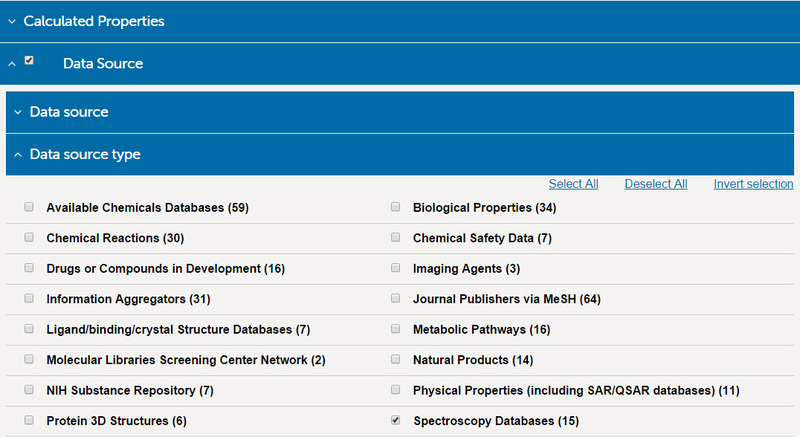 ChemSpider has over 10,000 spectra associated with chemical compounds in its database. Some of these are from commercial companies and organizations, but a large number have been uploaded by users of the website. As a result there may be spectra for compounds that are not available elsewhere. You will find that the spectra are available sometimes as JCAMP files ( in which case you can open them in the browser and interact with the spectrum using the embedded display tools - available as both Java and non-Java options) and other times users have provided pdfs, or image files( jpg, png etc). In addition to the spectra that are available within ChemSpider, some records provide links to other sites that have spectra data not available in the ChemSpider database, such as NMR ShiftDB and the NIST Chemistry WebBook. It is also possible to get some information about spectra using one of the sites API’s (see below), which you need to create an account (free) to use. 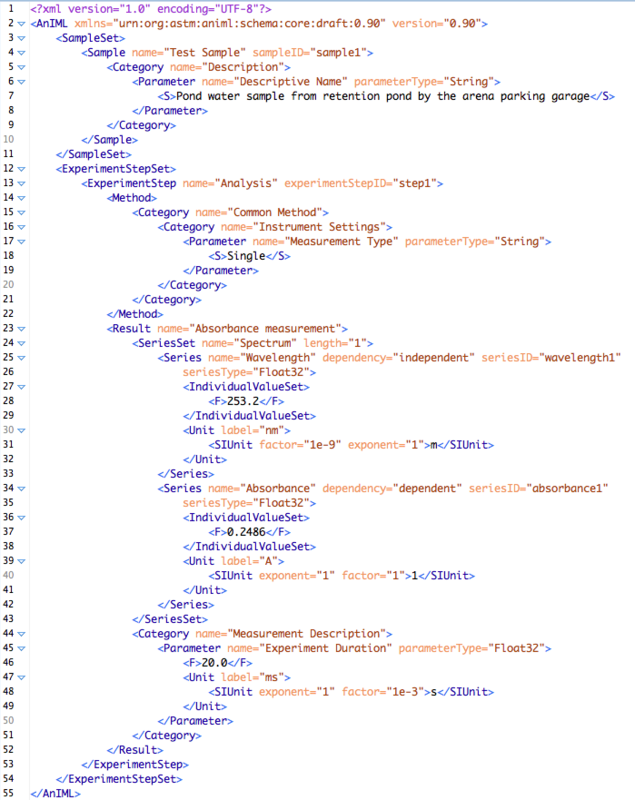 Access the following URL to get an XML file that lists all current spectral data by entering your security token in the ‘token’ field, which can be found on the http://www.chemspider.com/UserProfile.aspx page once you login on the ChemSpider website. There are tools to help you find ChemSpider records that have "Analytical data" - this term is used to encompass any of the following types of data: NMR, IR, UV-Vis, MS and Crystal structure. The option to return on but provide an option to filter results according to whether they have analytical data (this includes IR, MS, NMR, UV-vis and Crystal structures). This option is available by clicking on the Filter button that is available on of the search pages (Simple, Structure, Advanced) - but not on the quick search boxes that are provided on the homepage or in the header bar and then checking the the Filter only those having analytical data option. While you can use this option in any search you should think carefully when performing exact searches: try searching for ubiquinone with the Filter only those having analytical data option checked and unchecked. By contrast, the Filter only those having analytical data option works well with queries that are expected to return many results, for instance searching for all records which have a name that contains the substring hydroquinone (hint: use *hydroquinone* as the search string). In fact, using the Advanced search page you can add the filter to any of the searches, opening up the ability to search by, Molecular formula, Average mass, predicted properties etc. and see records which have some analytical data (but do remember that this filter can return records that have crystal structures but no spectra). ChemSpider can also help users identify other resources that might have spectra data that are not available in ChemSpider itself. If you look at the Data Sources tab (you often need to use the More dropdown to access this) in a record (eg Malonic acid - http://www.chemspider.com/Chemical-Structure.844.html) we have links to lots of other useful resources, you don’t have to scan through all of these to find useful data, there are sub-headings that display sub-sets of data sources according to their classification. Two relevant headings are Xtal structures (short for crystal structures) and Spectral data which list other websites and databases that have spectra data for that compound. Where possible the external id will act as a link to the record on the external resource. The data source selection options can be combined with other search parameters. However, the one thing to remember is that the data in ChemSpider is only as recent as the last update provided by the data sources - so there might be cases where data that can be found by searching the individual databases is not found in a search on ChemSpider because it was added to the indivudual data base after the last update supplied to ChemSpider. ChemSpider has over 10,000 spectra associated with chemical compounds in its database. Some of these are from commercial companies and organizations, but a large number have been uploaded by users of the website. As a result there may be spectra for compounds that are not available elsewhere. Finding compounds that have spectra available is not easy to do and in fact you can only access this information via one of the sites API’s (see below), which you need to create an account (free) to use. Access the following URL to get an XML file that lists all current spectral data by entering your security token in the ‘token’ field, which can be found on thehttp://www.chemspider.com/UserProfile.aspx page once you login on the ChemSpider website. 3. Go to the first JSpecView page above or download the JCAMP Viewer software for your OS. Import each of the spectra into the viewer you choose and export them to X,Y format. 4.Finally, import each of the X,Y data files into Excel with one sheet for the MS data, one sheet for the IR data, and another sheet for the NMR data. Plot the three IR spectra on one graph (so they are overlaid) and do the same for the MS and NMR data (so you end up with three graphs). Save the file.